HICKMAN – Looking to help clients in a proactive way, Brent Reynolds of the Cortland area and Cole Anderson of Lincoln decided to start a company that’s literally one of just a few of its kind. Peak Consulting LLC, based in Hickman, is a company that works directly with bankers to unlock the full potential of their banking software. In their time in the industry, the Peak Consulting team has spent more than 7,500 hours on site working with banks. Although Peak Consulting is a technology company and invests in the best technology, they value the face-to-face connection with clients and an on-site business model. As the industry pushes toward remote work, Peak Consulting takes pride in its interactions with clients. “That’s why we have a 78 percent return rate because we can be that person who actually goes in, and we can see that lightbulb click on their face, which you can’t do through a remote setting,” said Anderson, executive vice president and loan consulting director. Peak Consulting assists clients in maximizing a banking software created by Fiserv, a global organization that creates financial services technology. Reynolds, president and consulting director, and Anderson are no strangers to navigating the Fiserv software. They both worked at Fiserv’s Lincoln office for several years before this new business venture. Peak consultants have already performed services in 37 states. Reynolds said they take the time to understand and get to know each bank’s culture, staff and processes to deliver services targeted toward them. Consultants at Peak Consulting travel across the country to meet with banks and participate in around a dozen conferences each year. Peak Consulting opened a little more than one year ago, and Anderson said the first year has been tough because banks budget out a year ahead so getting financial commitments are difficult, but the team has pressed through. So much so that they were able to bring on Christine Mollhoff of Lincoln two months ago as the marketing director and deposit consulting director. Mollhoff worked at Fiserv for more than 18 years before joining Peak Consulting. Moving forward, Reynolds and Anderson said they are looking to go beyond just the Fiserv platform and hope to grow into each of the four major banking software companies. They hope to be able to offer additional services to clients and expand into other areas of consulting as well, but all of these will take time, Reynolds said. “There’s times when we may entertain taking risks and expanding the company in a way that is taking advantage of opportunity, but at the same time, we want to make sure that we do it in a way that’s sustainable and keeps a good foundation for our needs,” Reynolds said. 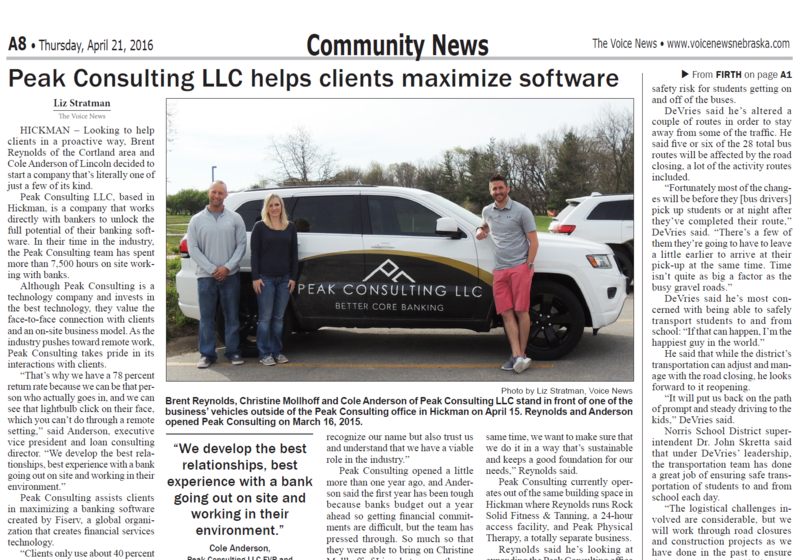 Peak Consulting currently operates out of the same building space in Hickman where Reynolds runs Rock Solid Fitness & Tanning, a 24-hour access facility, and Peak Physical Therapy, a totally separate business. Reynolds said he’s looking at expanding the Peak Consulting office in a way to better accommodate the company’s needs and thinks he’ll move forward with some sort of expansion within a year.